For over three decades the San Diego California construction accident attorneys at DiMarco | Araujo | Montevideo have been there for construction workers and their families when they needed them most: after an on-the-job injury or work accident. We have represented the full range of possible construction injuries from ligament sprains and amputations to welding injuries and hammer injury accidents. We promise to work hard each and every day to continue being the best San Diego construction injury attorneys. We can help you and your family be awarded and receive the maximum compensation that you legally deserve. Our successful reputation throughout San Diego as top construction accident lawyers speaks for itself: We are ethical and experienced San Diego construction injury lawyers who will work tirelessly for their clients throughout the entire legal process. What’s involved in filing your legal claim(s) for workers’ comp and/or third party personal injury. How our law firm could make your case simple, efficient and successful. Potential litigation issues including: pleadings, investigation, legal evidentiary standards of proof and legal requirements, lay and expert witness depositions, written discovery, law and motion, types of causes of action, potential special and general damages including: loss of earnings, bodily injury, medical treatment, and other damages and benefits you are entitled to recover. The answers to any questions you or your loved ones may have about how we can help you navigate through the legal system during this very difficult time. The costs and financial commitment that is needed for preparing for the case, litigation and going to trial if you go it alone and how our law firm could help you with that aspect of the legal process. Our experienced San Diego County work injury attorneys and staff are available to take the load, stress and pressure of a lawsuit off you. If after meeting with us, and hearing about all the steps needed to file and handle your construction injury claim, know that we are always here for you. We wish you and your family all the best and the speediest of recoveries. Receiving the maximum potential compensation is important for you because your injury or accident may have long term side effects and long term related expenses. It is only right that you are fully compensation for an injury that was someone else’s fault. You deserve the best representation that you can get. We will allow you to focus on healing as we do all the hard legal work. We can guide you throughout the process, properly investigate your case and ensure you are receiving comprehensive medical care. To make our services even better is the fact that our law firm is very affordable. Not only is the initial case consultation and case evaluation free, we will even work on a contingency basis so you will not owe or pay our firm anything unless and until we win your case. You can rest assured that we will work hard for you because the Better Business Bureau gave us their highest award of an A+. We are ready to start your San Diego work injury case, workers’ compensation, or personal injury case so call us today at (619) 946-6466. The State of California requires that all construction workers (and all employees in general) are covered by their employer’s workers’ compensation insurance no matter if they are part-time or full time employees. Workmen comp can potentially provide you with some assistance if you have been hurt while working. In fact, your employer isn’t allowed to fire or penalize employees for filing a workers’ comp claim. Frequently after a work injury to an employee, employers are required to pay that employee disability out of their workman comp insurance. It is important to know that workers’ compensation insurance does have limits including that it does not allow for damages for pain and suffering. The workers’ compensation insurance that is paid for by your employer could pay you or your family income, death benefits, disability, medical expenses, medical benefits, vocational rehabilitation and/or permanent disability compensation, when the injury and/or circumstances warrants. One common example of a work compensation claim for construction workers are musculoskeletal disorders. MSD injuries build up over a period of time from the injured person’s motions, tasks or assignment on the job such as twisting, bending, exerting too much force, or working in an uncomfortable position. Be sure to call our San Diego workers’ compensation attorneys to talk about your workmen comp claim. We will answer all your questions about what happens after injury at a construction site when you call us or meet with us. This includes if you are wondering what the workman comp benefits would be specifically for you and your case, how State Disability Insurance (SDI) works, and how much a workers’ comp lawyer costs or how much a work injury attorney costs. Just remember that since we work for clients on a contingency basis, you will not have to pay anything unless and until we win your case. Construction sites can be chaotic with different workers or contractors doing different jobs at different times all across the site. Many different people, delivery trucks, workers, machines and vehicles are moving in all directions so that means that many construction accidents not only qualify for workers’ compensation because of the job injury but they also may qualify for a civil third party work injury claim. A third party is when one or more additional responsible parties are determined to also be at fault for your job accident other than just your employer. By adding the third party case, you and your family have a chance to receive compensation that is above that which is called for by the workers’ comp laws. A third party on a construction site could be a building owner, subcontractor, the training company, the equipment or tool manufacturer, the land owner, developer, or the general contractor. Call one of our local San Diego work accident attorneys now to discuss this and your case’s potential. It is especially important to have our prudent guidance early on since injuries with third parties also at fault need to be handled correctly at all points in the process since a mistake in any of the trials or procedures could affect the other(s). You will have excellent workers’ compensation and work injury lawyers who will be with you every step of the way. Though the Occupational Safety and Health Administration (www.osha.gov) has many missions, one of its main tasks is to keep work environments as safe, healthful, and injury-free as possible. OSHA is most likely sad to report that even now “Every day in this country, more than 14 workers lose their lives in preventable workplace tragedies.” Due to that reality, they are continually attempting to improve the rules, safety standards and workplace injury prevention programs so that less people get hurt on the job, hit by a falling tool, amputated by a punch press, crushed at the factory, maimed at the construction site, fall off of a ladder, cut by a power saw, pinned by a machine or injured while on the job. OSHA’s goal is to set standards and laws in place to avoid construction accidents and construction injuries and keep the construction job site safe. OSHA is determined to help construction employees avoid injuries by also improving standards for what counts as training, how often training needs to occur and who can be a certified trainer. OSHA states that they will keep the names of all employees or contractors who complain about their job site’s OSHA violations, unsafe working conditions, work equipment’s worn status, unsafe work hours and potential construction accident risks anonymous, if the employee requests it. A construction site can be full of dangers and potential injury risks for construction workers. This vast amount of danger is why it remains so critical that OSHA, employers, general contractors, bosses and supervisors do everything they can to follow the Occupational Safety and Health Administration workplace safety code to keep employees protected from accidents and injury. The following are ways in San Diego that a construction worker can be injured while on the job: hammer injury or drill slip, pit cave-in, corrosive chemical injury, scraps and debris falling injury, faulty wiring, slipping or tripping and falling, being caught in, between, or under machines, equipment or objects, tunnel cave-in, fire, falling off of a cherry picker, tilt-up injuries, trench cave-in, falling through a skylight, rebar impalement injury, reinforcing bar injury, hole cave-in, gas or chemical explosions and exploding concrete lines. Other types of injuries that can happen while working include lifting injuries, being struck by a falling rail, beam, tool, wood board or piece of equipment, crush injury, pallets failing, being crushed by a truck, crane, bulldozer, grader, pile driver or trencher, a tool or load not being strapped in or harnessed correctly, compressed gas injury, derrick injury, being run over by truck, forklift, tractor, or dump truck, a nail through a boot or shoe injury, falling off of a roof, building or piece of equipment, exhaustion, heat stroke, lung injuries, asbestos, safety rail failures, accidental electrocution, and wrongful death. Most construction sites will have plans for what to do in the case of an injury but it is smart to also call 911 to be safe. If you do not have your own doctor for your construction injury or if you need help getting medical treatment, we can help you find a local doctor that will give you the attention that you deserve. Many results of construction job accidents and construction site injuries could be traumatic. Concussions, lacerations, amputation, brain injury, blindness, contusions, eye injury, back injury, coma, muscle strain, broken bones, burns, ligament sprain, neck injury, cuts, becoming deformed, heavy bleeding, being crushed, and death are all possible outcomes of construction accidents and job site injuries. Since 1979, the construction accident lawyers of DiMarco | Araujo | Montevideo have helped construction workers with their legal injury cases for the above injuries, results and much more. A construction site is filled with different types of heavy machines, dangerous tools and machine operators with a whole range of skill and training. Possible tool and machine injuries on the job include table saw injury, chainsaw injury, ladder injury, scaffold collapsing, scaffold injury, automobile or car accidents, concrete accident, saw, drill or hammer injury injury, conveyor belt injury, lathe accident, welding injury, motorcycle accidents, tractor injury, sheet metal injury, being caught in a baling machine or punch press, backhoe injury, nail gun or power stapler injury, radial arm saw injury, power tools injury, catwalk fall, load dropping injury, load shifting accident, concrete saw and circular saw injury, needle scaler injury, angle grinder accident, floor sander injury, impact wrench accident, defective machines, crane injury, and ceramic tile cutter injury. Employers, manufacturers and distributers must work harder to prevent these potential injuries. Some more industrial or residential remodeling construction equipment injuries for employers and employees to be aware of and respect are air compressor injury, jointer accident, heat gun injury, disc sander accident, jigsaw injury, pneumatic torque wrench accident, steel off saw accident, trimmer accident, biscuit joiner and bandsaw accident, scrollsaw injury, sabre saw accident, rotary tool injury, diamond blade injury, alligator shear injury, elevator injury, wood router injury, jack hammer injury injury, random orbital sander injury, reciprocating saw accident, or defective products. Some of the biggest makers of construction tools are Stanley, Black & Decker, Porter-Cable, Old Milwaukee, Caterpillar, Hitachi, Bobcat, DeWalt, Husky, Craftsman, Ryobi, Ridgid, Amada, Snap-On, and Makita. It is important to keep all tools and machines well maintained and to be on the lookout for other coworkers or subcontractors who are using tools and machines that are not functioning properly. There are also many vehicles and pieces of heavy equipment that can cause harm, catastrophic injuries or on the job accidents to someone with only a quick slip or mistake. On a job site, it is possible to have a scraper accident, highway bottom dump accident, backhoe loader and backhoe injury, feller buncher injury, excavator or bagger injury, asphalt paver accident, yarder injury, aerial work platform or lift table injury, drilling machine accident, dragline excavator injury, vibratory compacter injury, cure rig accident, concrete batch plant injury, street sweeper injury, soil stabilizer accident, dredger injury, harvester injury, articulated hauler and articulated truck accident, lowboy injury, pneumatic tire compactor accident, forklift injury, dump truck injury, wheel forwarder accident, slipform paver injury, roller, road roller and roller compactor injury, fresno scraper accident, rotary tiller accident, stomper concrete drop hammer injury injury, steam shovel accident, wheel tractor-scraper accident, cherry picker injury, bulldozer accident, tunnel boring machine accident, track loader, telescopic handler accident, front shovel accident, underground mining equipment injury, track skidder and track-type tractor injury, or a venture mixer injury. It is critical to be alert on the construction site for danger and harm and to demand that your general contractor requires all the employees working on the site to have adequate training for all the machines and tools they’ll be using. A construction site usually consists of many people all doing separate but interconnected jobs. It can possibly be quite a chaotic scene. The trades that may be occurring all at the same time include work by street fixers, roofers, carpet layers, project managers, plasterers, carpenters, fencers, electricians, inspectors, pipefitters, tin knockers, concrete finishers, landscapers, bricklayers, laborers, plumbers, heating and air conditioning technicians, tile layers, welders, truck drivers, architects, tile setters, janitors, geologists, supervisors, diggers, concrete pourers, concrete mixers, crane operators, painters, and heavy equipment operators. Injuries happen on a construction job for many reasons including: worn-out tools, misusing equipment, faulty equipment or wiring, lack of adequate training for construction workers, lack of adequate construction or trades workers, lack of proper safety protections or safety inspections, damaged or defective machines, substance abuse by coworkers while they are working, defective products, lack of safety gear (ei: hard hats), and sub-contractor negligence, general contractor negligence, foreman negligence, coworker negligence, and property owner negligence. As you know all too well by now, construction accidents also happen because someone was just trying to do something the quick and easy way. Landowners should also be aware of premises liability as they could be held responsible for many injuries that happen on their land. In many cases, an injury victim will have a workers’ compensation claim to file and a third party case if the party partially or fully responsible for the injury might not be the employer. Our federal, state and local levels of government all have regulations in place to try to keep construction workers and the public safe. These standards are continually refined and updated as new technologies and risks are discovered. This includes inspecting projects at the important and final stages, developers, issuing permits to builders, and manufacturing and continuously improving the codes for safety standards, work environment, and procedures. There are also many ways that a government can be directly at fault as well. This government oversight can create a duty and responsibility of the building, safety, permit and/or planning divisions of any municipalities, state and federal governments. Most cities, county or statewide agencies have a building and planning division that oversees commercial and residential construction projects. One of their duties is to review all of the plans to ensure safety throughout the construction process. We have over three decades of experience with government liability cases in San Diego and statewide and we can help you. We are actually even very involved in the statewide consumer protection group called Consumer Attorneys of California. 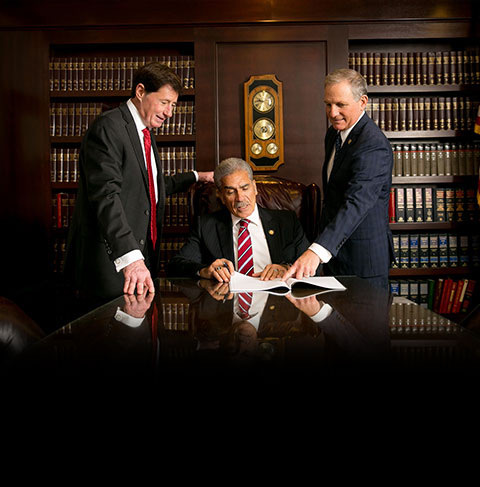 We offer a free initial consultation and case evaluation. We are well known throughout San Diego, California, Los Angeles, San Bernardino, Riverside, Long Beach, Orange County, and the San Francisco Bay Area as top construction accident lawyers who know how to help you. If you chose our firm, we will work for you on a contingency basis so you will not owe us anything unless we win your construction accident or injury case. The construction accident attorneys at DiMarco | Araujo | Montevideo San Diego make house calls as we come to you at your home or your hospital room if you are unable to come to our office. We are available to meet during the normal hours of Monday through Friday between 8:30am and 5:30pm and we will also meet you, by appointment, on Saturdays, Sundays and in the evening. Many people throughout San Diego consider us to be the best construction accident attorneys around and we will do our best to maintain that excellent reputation as construction lawyers.